What’s better than a normal cupcake? Lemony Cupcakes! 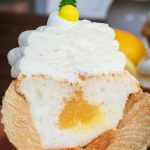 Lemon curd stuffed in an angel food cupcake and topped with lemon whipped cream frosting – Lemony Cupcakes of my dreams! 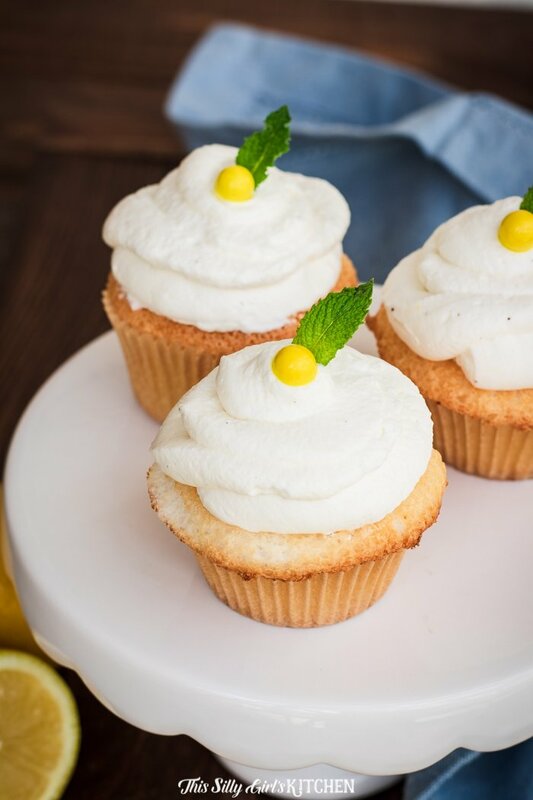 These lemony cupcakes are what spring dreams are made of. I absolutely love the taste and texture of angel food cake. What’s even better than angel food cake is lemon cupcakes that provide me with enough lemon zest along with that air like texture of angel food cake. YUM! While Mother Nature is busy trying to figure out what season we’re in, these cupcakes will delight your senses. The lemon whipped topping is so delightful that you’ll just think spring has arrived. 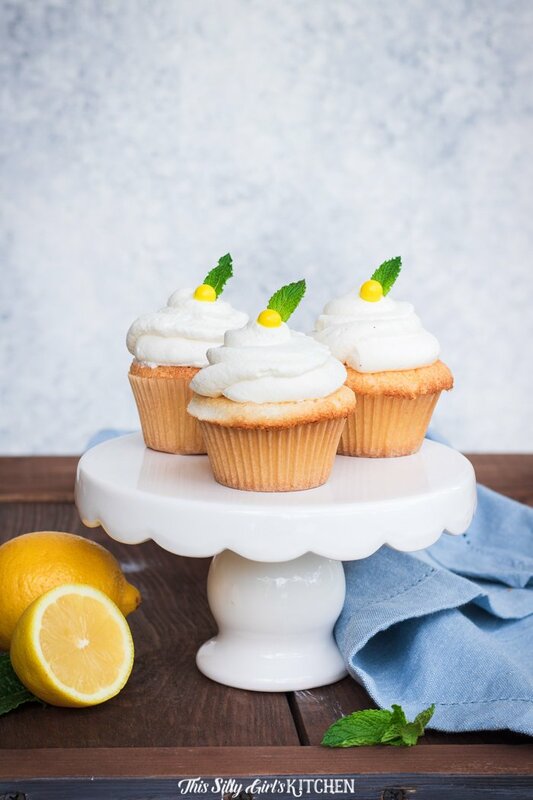 If you need a little sunshine in your life, then these lemon curd cupcakes will not disappoint! If you’re in a hurry and want to cut some corners, you can cut down a little time when you purchase a brand name boxed angel food cake to make instead of making this from scratch. I don’t judge, I love box mixes myself! In addition, you can cut more corners by purchasing the lemon curd in the jelly and jam aisle at your local grocery store. 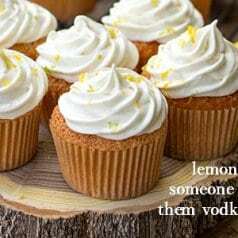 This will save much time and leave you only with the task of creating your whipped frosting for the lemon cupcakes from scratch. 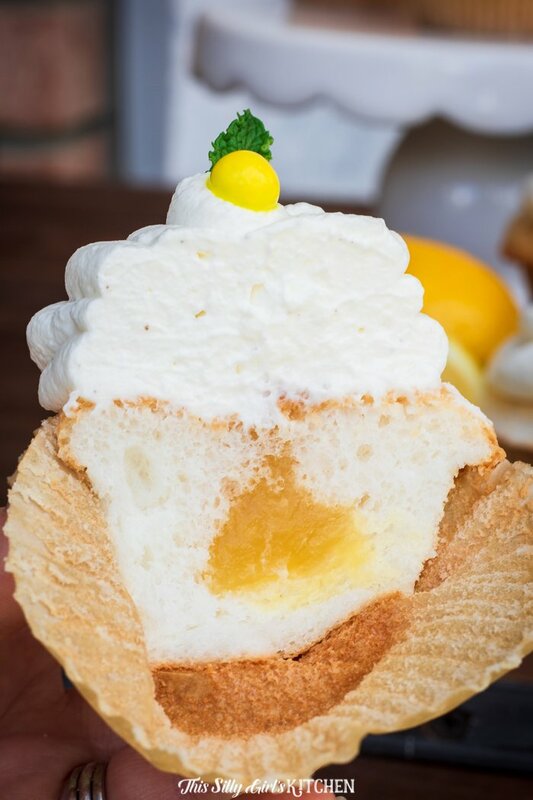 Use a piping bag to fill the angel food cake cupcakes with lemon curd. Or, you can even put the curd in a small ziplock bag and cut a small tip off one of the corners and use it as a piping bag. 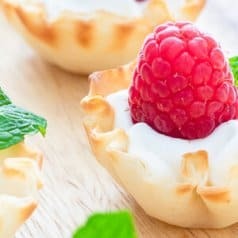 You don’t have to fill the lemon curd cupcakes with a lot of curd, as the flavor is pretty concentrated so a little bit goes a long way in flavor. Be sure to taste test a cupcake before filling the others so that you’re sure of the appropriate amount of lemon curd filling in your lemony cupcakes. Whether you decide to cut corners or make these lemon curd cupcakes entirely from scratch, you won’t be disappointed. This is a delightful recipe that simply melts in your mouth and makes you smile. What Frosting Goes with Lemony Cupcakes? 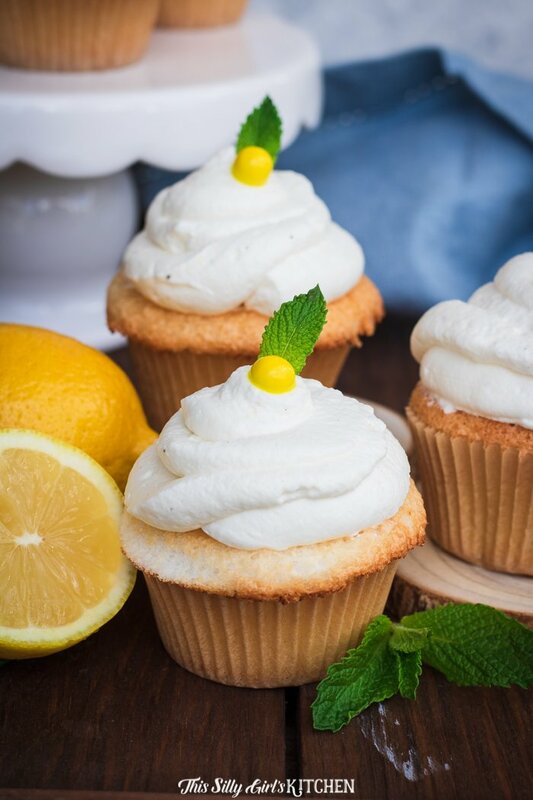 Lemon whipped cream frosting is my favorite option when it comes to frosting lemony cupcakes. This homemade whipped cream frosting will taste absolutely delicious on top of your lemon curd cupcakes! The trick is to make my homemade whipped cream frosting as the instructions cite below, don’t take any shortcuts. This will ensure you get the most flavorful lemon whipped cream frosting for your lemony cupcakes. How to Decorate Lemony Cupcakes? 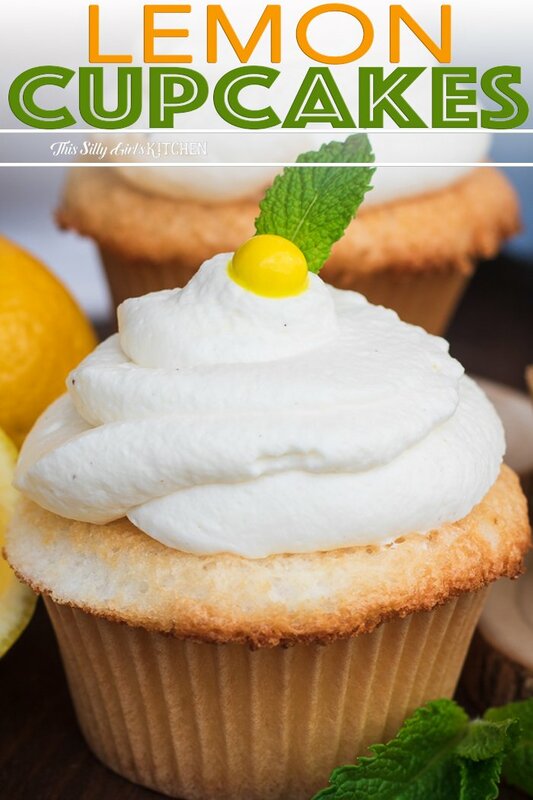 You can easily decorate your lemony cupcakes with some cupcake toppers from the store. I used a yellow large pearl type sprinkle plus a little mint leaf to mimic a little lemon on top! If you really want to make your own decorations for the top of your lemon cupcakes, feel free to use some food coloring to dye the lemon whipped cream frosting. Take the piping bag (or ziplock bag!) and decorate your lemon cupcakes with the color of your choice. This is the perfect way to add some color to your lemony cupcakes for a special event or birthday party. Can you Freeze Lemon Cupcakes? While these lemon cupcakes are too good to not gobble up, there comes a time when you may need to freeze these lemon curd cupcakes. Place your lemon cupcakes in the freezer on a baking sheet. Once the whipped frosting is completely frozen, pull the cupcakes out of the freezer. Wrap the cupcakes in plastic wrap and place back into the freezer. You can store the lemon cupcakes for up to three months in the freezer. 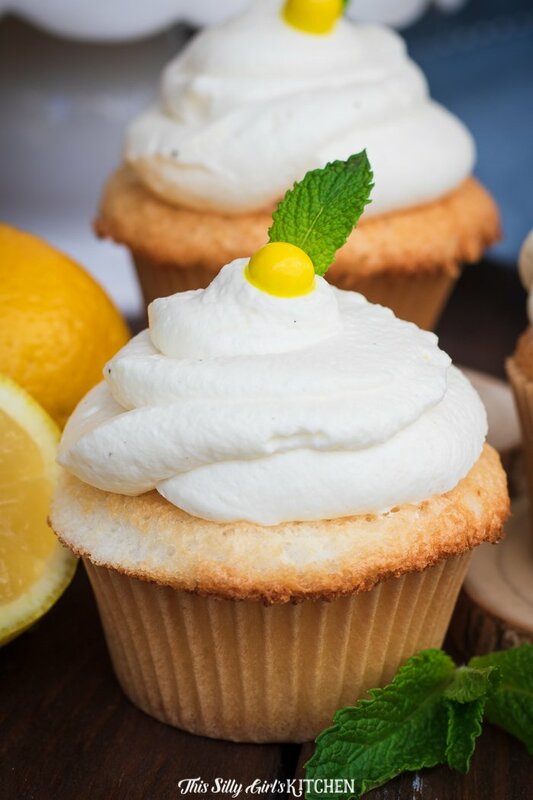 Now you can save these lemon cupcakes for a later date. When you’re ready to indulge in this delicious treat again, simply remove the lemon curd cupcakes from the freezer. 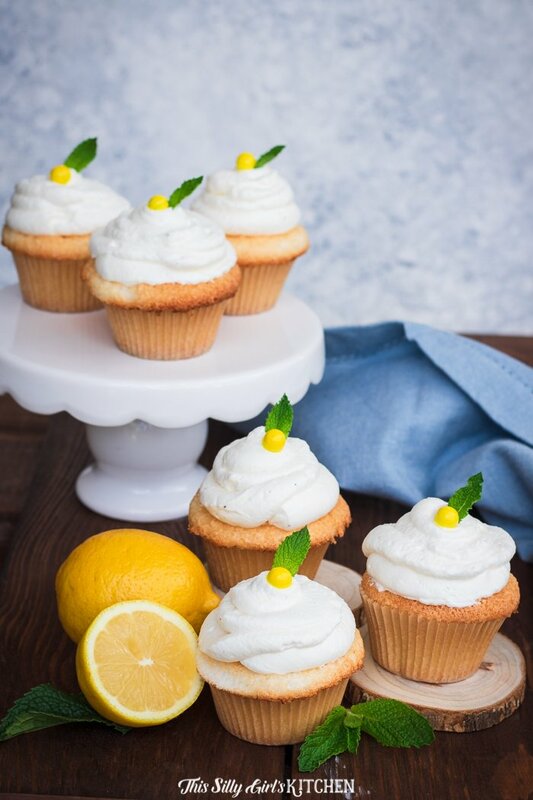 You’ll need to thaw your lemony cupcakes at room temperature or in the refrigerator for six hours. You can also freeze these without the frosting on top. I suggest to freeze them this way, and make the frosting fresh. Lemon curd stuffed in an angel food cupcake and topped with lemon whipped cream frosting. Place the lemon juice, sugar, egg yolks, butter, and salt into a small saucepot. Whisk to combine. Place the saucepot over medium heat and let come to a slow boil, whisking constantly, or it can burn on the bottom. Continue to boil the curd gently for 3-4 minutes, stirring constantly until thickened. Take the pot off the heat, let cool. Use to fill the cupcakes or store in an airtight container in the fridge until ready to use. Preheat the oven to 350°F. Line a cupcake tin with cupcake liners and set aside. In a food processor, add the sugar and pulse until very fine, about 2 minutes. Sift half of the sugar with the flour and salt, set aside. In a large bowl add the egg whites, add in the water, vanilla, and cream of tartar. With a hand mixer or a stand mixer, mix on low until fully combined. Gradually add in the remaining sugar until well mixed in. Place mixer on medium speed until egg whites form medium peaks. Start to add in the flour mixture a little at a time by sifting it onto the surface of the egg mixture and folding it in in very small batches by hand. Fill the cupcake liners about 3/4 full. Bake for 16 to 18 minutes or until a toothpick inserted into the middle comes out clean. Let the cupcakes cool for 5 minutes in the tin, then transfer to a wire rack to cool completely. Add the heavy cream to a large bowl. Using a hand mixer or stand mixer with the whisk attachment, mix on low until bubbles start to form. Add in the powdered sugar one tablespoon at a time, mixing between additions. Add the cornstarch and vanilla once the cream starts to form soft peaks. Continue to mix on medium speed until the cream will stand up on the whisk and will not move. Do not over beat or you will have butter. Add in the lemon curd, and fold in by hand until fully combined. Only assemble the lemon cupcakes once the cupcakes are completely cooled. Add some lemon curd to a piping bag with a small round tip. Gently press into the middle of the cupcake about 1/2 inch down. Squeeze some curd into the cupcake center, only about a teaspoons worth. Continue with all the cupcakes. Place whipped cream into a piping bag or frost however you wish. Add mint leaves and large yellow sprinkles for garnish, if desired.